Are you stuck in your comfort zone? Are you searching for something greater? While it is easy to get comfortable with going about your business throughout the week and then showing up at church for an hour on Sunday, you are called to much more. Greatness, growth, and significance in the kingdom of God is found on the path of service. In this practical and inspiring book, Nelson Searcy motivates readers to take the next step on their journey toward maturity in Christ. As Searcy explains, if you're not serving, you're not growing. Whether you're already committed to multiple ministries or have just started attending church, he provides the tools you need to get connected through service. 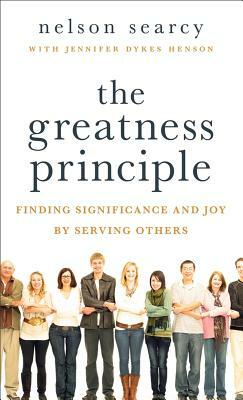 The Greatness Principle, a perfect companion to Connect, is designed specifically with the individual believer in mind. Priced right for small groups and church-wide campaigns, this little book packs a wealth of practical insight and inspired ideas that will energize church members and have them clamoring to volunteer their talents for the sake of the kingdom. Nelson Searcy is the founding and lead pastor of The Journey Church. Started in 2002 in New York City, this groundbreaking church sees the majority of its growth coming from new believers and currently meets in locations in Manhattan, Queens, and Staten Island, as well as additional locations in San Francisco and Boca Raton. Nelson is the recipient of the prestigious 2013 Donald A. McGavran Award for Outstanding Leadership in Great Commission Research. He is the author of more than seventy-five church growth resources and twelve books, including The Generosity Ladder, Maximize, Connect, and Ignite. Nelson is also an experienced church planter, coach, and church-growth strategist. Before to founding The Journey, he served as the director of the Purpose Driven Community at Saddleback Church. He is also the founder of ChurchLeaderInsights.com and the Renegade Pastors Network.Jennifer Dykes Henson is a writer, wife, and mom to two young girls. She has coauthored several bestselling books, including The Generosity Ladder and Tongue Pierced. Previously, Jennifer worked with Dr. Charles Stanley as the marketing communications manager for In Touch Ministries. She lives with her family in Atlanta, Georgia.